Thaipoosam Cavadee is a spiritual festival held in Mauritius to show gratitude and affection to the Hindu goddess Parvati and god Muruga who conquered the evil demon Soorapadman. Cavadee originates from Southern India so it is mostly celebrated by Mauritian Hindus of Tamil origin. Thaipoosam is derived from 2 Tamil words: Thai or Tai (the 10th month), and Poosam (the highest position of a star). Devotees build their Cavadee, with everyone giving a hand, family, friends and neighbours. Cavadees vary in size. Some are as high as three metres. They are made of wood and bamboo in the shape of an arch to symbolise a mountain. Extra are added, such as bells, bright clothes, colourful flowers, coconuts, limes, peacock feathers, banana leaves and miniature icons of Lord Muruga. They have pots of milk hanging at each end. Worshippers carry the smaller Cavadees on their head. The larger ones are pulled by strings attached to hooks pierced into their backs. Cavadee means to carry a piece of wood and it is a burden. It’s a spectacle to watch, with people wearing brightly coloured clothes of pink and saffron, carrying flowers down the street and dancing the ritual Cavadee dance. The men are often bare chested with just a loin cloth or sarong. The parade will head towards the local temple. Once inside they will lay down their offerings to the lord Muruga and remove the hooks from their bodies. This is a sacrifice aimed at purifying the soul of devotees. Then the flag is brought down marking the end of the Cavadee festival. 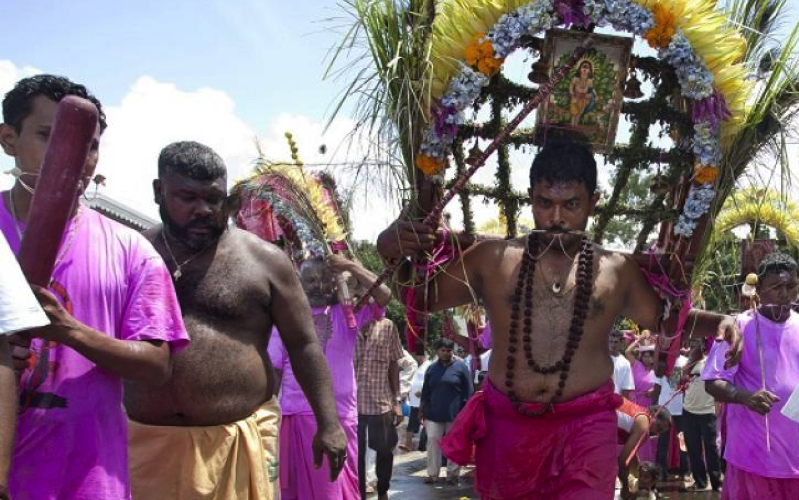 The Cavadee s usually celebrated in the 10th month of the Tamil calendar which falls between January and February. A ten day fasting starts with a flag hosting ceremony at the temple. Fasting and prayers contribute to the deep spiritual uplift. Cavadee in Mauritius takes place in most parts of the island. You can join the parade anywhere anytime and experience the culture and colourful spectacle.